Bingo is probably the oldest gambling entertainment among the huge casino games variety. The game originated in 1530 in Italy and was called at that time "Il Giuoco del Lotto d'Italia". Beginning with 18th century bingo began to spread all over the world gradually catching on in France, Germany and other countries. In America the game was firstly played with dried beans and was called 'Beano' consequently. The name 'Bingo' became current after famous case when one of the most inveterate bingo players Edwin Lowe won and all of a doodah screamed 'Bingo!' instead of 'Beano'. The other version of the word 'Bingo' states that earlier it was used for the game of lotto in England. At the beginning of the game all bingo players are provided with papers, which contain 5x5 matrices with different numbers. A presenter announces series of numbers, which are drawn randomly, and gamblers need to match them with those ones that are printed on their papers. Players mark the places in the paper they wish to play with and in the process of announcing numbers they daub the matches. In case gamblers get certain combination of matches, they are considered winners. A classical winning combination is obviously a straight line of matches, but different game versions provide also other arrangements such as 2x2 matrices of matches or 4 corner matches. 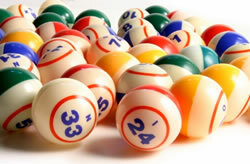 Probably, the biggest fun concerning bingo game is the moment when some lucky player calls out 'Bingo!' if he or she gets the needful combination. In order not to mislead other players and avoid possible, premeditated or not, mistakes all the results are checked carefully before the official winner is announced and rewarded. There are usually 75 numbers which are used in the game while players have just 25 numbers on their cards, which are placed in a squared grid of 5 rows and 5 columns. In the middle of the grid there is a free of numbers space, which is marked with a note 'Free space'. It is usually that at the top of paper the word 'bingo' is written so that each column has a heading of one of its letter. In terms of game variations bingo could compete with slots game easily as there is a huge amount of bingo versions. Almost all of them are considered to finish when the first player completes a particular pattern of drawn numbers in his or her printed paper. However, nowadays special electronic displays are often used instead of old-fashioned bingo cards.